There's still time to apply for our exciting new short course led and taught by Professor Sir Peter Cook. 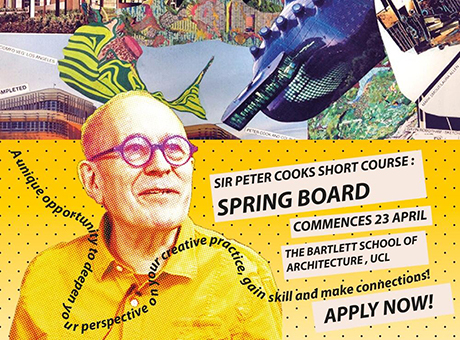 Bartlett Springboard, which runs from late April to July 2014, is designed for architects who wish to extend the range of their work and have it tuned, reconfigured, exposed and discussed in an intensive workshop. Participants may use the course as an opportunity to develop an existing project or to embark on something completely new and unexpected. Based at the Royal Ear Hospital building alongside the school's post-professional programmes, participants will become part of the Bartlett’s vibrant community. They will be invited to act as critics for the Bartlett School of Architecture’s review sessions, and to take part in workshops and seminars. They will also be introduced to a group of cutting-edge London offices and their own work will be reviewed by key figures from the local and international academic and architecture scenes. For further information and to apply, visit the programme webpage.